Uses: as a relaxer; for aches and pains; for skin care; for inducing sleep. Safe, versatile and held in highest regard for thousands of years, chamomile is one of the most important oils of all. Nowadays, you will see two or even three kinds of chamomile on sale: Roman, German and Maroc. Which do you use? Roman and German are very similar. German is less common and more expensive with a stronger blue color. Its one advantage over Roman is possibly some extra power against skin complaints and so it tends to be used when the severity of the complaint justifies the extra expense. Maroc is a relative newcomer. Strictly speaking, it is not chamomile at all except by common name. It is disregarded by some experts because it does not have as many uses and may not have such a powerful effect as Roman or German chamomile. However, it is cheaper and quite similar, and should be found effective with skin problems and as a relaxer and reliever of tensions. Roman chamomile, Chamaemelum nobile, also called sweet, English, garden and true chamomile, is the one of chamomile lawn fame. It has a daisy-like flower, ferny leaves and a sharp apple scent. Chamomile is not only good for people. Also called the ‘Plant Doctor’, it is supposed to help the growth and well-being of the other plants in the garden just by being there. The oil is distilled from the flowers and is middle note. Effective to a certain extent in all kinds of emotional and stressful conditions, chamomile is especially commended as a calming substance. When someone is upset by a traumatic experience, feeling they can’t cope with life, suffering with ‘nerves’ or stress, this oil can be most helpful. Its usefulness as a calming agent combines well with its anti-inflammatory and mild pain-killing properties in such problems as infant teething troubles. Try chamomile in the child’s bath, or in an aroma ring in the nursery. Obviously, any sort of pain or physical irritation will negatively affect the sufferer’s mood. Both problems can be eased by chamomile. Suitable methods for relaxing with chamomile: water; applicators; vaporizers; massage. Its ability to reduce inflammation is one of the most prized features of this many-sided oil. It is also credited with a gentle analgesic effect and so many uses can be suggested where muscles and joints are swollen and causing distress. Rheumatic and arthritic sufferers can look to chamomile for relief, as can children and adults with much more short-term complaints, such as tiredness after exertion. Next time you walk those few extra miles further than you thought, try chamomile in a foot bath. What could be more pleasant than a chamomile massage after a vigorous work-out? Perhaps the first gardening week-end of the year has stiffened muscles which are not so young as they were? Chamomile will help here too. 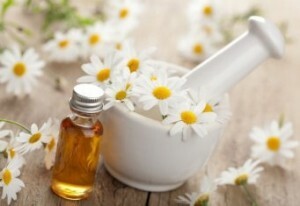 Methods for using chamomile for aches and pains: water; applicators; massage. Anti-inflammatory, gentle, soothing, antiseptic, able to give some relief from pain – this is obviously a good combination for skin which is sore from being wet and cold. Chamomile may also help with teenage spots, dry skin, windburn, sunburn, or even chronic skin conditions such as acne and psoriasis. A chamomile compress can be used to take the soreness out of a boil, a minor wound or burn, or an insect bite. Methods for using chamomile in skin care: applicators; massage. Along with lavender and some of my second group of oils, chamomile is one of the most frequently recommended oils for sleepless nights. It must be used sparingly, because too much can have the opposite effect. It is safe for children. Methods for inducing sleep: water; applicators; vaporizers; massage. Chamomile for use in digestive complaints Changes in diet bring about a whole range of problems, from constipation to diarrhea, from heartburn to flatulence. Chamomile can help in all such unpleasant situations, and while there is no known cure for a hangover, at least the world seems a less oppressive place with chamomile aromatherapy. Methods for easing digestive complaints: water; applicators; vaporizers; massage. menopausal problems. Its calming and muscle-relaxing powers combine to relieve such cases. Methods for menstrual problems: water; vaporizers; applicators. Roman chamomile is classed as a feminine scent. Although not widely used as a liquid ingredient by perfume manufacturers, try it by the vaporizing methods or in potpourri to give a feminine touch. Copyright © 2019 www.allaromatherapyguide.com All Rights Reserved.